“Every culture and subculture gets the drugs that it deserves,” writes Douglas Rushkoff in his forward to Tim Pilcher’s e: The Incredibly Strange History of Ecstasy, “In fact, almost every major cultural movement in history can be traced back to the chemicals it did or did not have.” This is a profound point -- it makes sense that the Thirty Years War was fought by people who had beer soup with a side of beer from breakfast, lunch and supper from the time they were three, and that the English Romantic poets were drowning in opium dreams, and that today’s Los Angeles scenesters are enjoying a Molotov cocktail of ketamine and crystal meth. The human hunger for altered states of consciousness runs the gamut from beautiful to destructive, with a good dose of the pathetic and banal thrown in along the way. e isn’t a strange history at all, but it is a surprisingly comprehensive one. e traces methylenedioxymethamphetamine (MDMA) from its roots in a Merck research lab in Darmstadt, Germany in 1912 (when a chemist who was trying to stop bleeding from wounds accidentally created a happy pill instead), through its rave culture heyday, to its embattled present moment, demonstrating how the same substance can be feared as a devil drug, revered as a therapeutic tool, adored as a mind-expander, used to inspire a music scene and the cause of a moral panic. Ecstasy isn’t the first drug with this complicated and powerful social effect -- Roman herbalists were sent to the mines for peddling magic plants -- but the details of its celebration and censure reveal all sorts of juicy truths about late 20th century media and culture. It’s not the first time people have scrambled around for an instant fix, for magical transformation without meditation practices or moral struggles or scholarship or effort, but by 1988, the “second Summer of Love,” life had become so hyper-instant, and so contrived, that every spiritual or experiential hope and dream seemed to be contained in that little yellow (or pink or purple) pill. Rabbi Zalman Schachter’s take on it is oddly sweet: “When God saw that people, instead of turning to God, were turning to the medicine cabinet, God made himself available in the medicine cabinet.” Tim Pilcher, a pop culturalist who writes mostly on cannabis and comic books, is clearly a “Generation Ecstasy” insider. Yet somehow his treatment of the subject stays balanced and nuanced. He avoids getting druggie or scene-y, and he also avoids the strange, academic stiffness that mars other recent work on youth culture and raves. 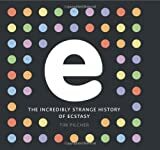 Also, e is a delicious candy necklace of a book, with textured pills on the glossy black cover, blazing yellow sunbursts featuring first-person “serotonin stories,” good pictures, and pages devoted to quotes from Keith Haring, George Michael, and former drug czar Barry McCaffrey. My friends were jealous that I had it, and I had to hide it in my bag at diners. Like many artifacts of MDMA culture, this history brings up a happy feeling. Why is ecstasy the drug “deserved” by eighties and nineties rave culture? According to an organic chemistry professor who tried a “rhubarb and custard” with his girlfriend, it brings up the waves of euphoria associated with tai chi and other martial arts and practices of deep meditation. But unlike those lifelong practices, it has a “honeymoon period,” feeding on excitement and novelty. After a while, the brain assimilates the MDMA experiences of oneness with the universe, euphoria, and “overwhelming feelings of well-being,” and starts to get cranky. People start to compare their early, “perfect” trips with their later ones. However wonderful it felt, that feeling goes away, and you have to start the search for a new quick fix, a happier happy pill, or else you face a “crushing disappointment.” Yes, there are police breaking up the rave, and yes, there are ever tougher laws banning “spiritual” or mind-altering drugs. But the real end of the party comes from within.